the only place you can be a pagodian! Welcome to our Pagodian community! All of us at Pagoda would like to wish you a warm welcome, whether you are going through our pages for more information or just dropping by. We are a private, Neo-related, chat-based, literate guild that aims to your one-stop-shop for everything Neo. We offer a wide range of activities and pages, ranging from dailies to avatar lending. Our humble abode consists of wonderful (and sometimes quirky) members. Each and every person brings something new and exciting to the mix. We provide a home for those who are children at heart and for those who are wise beyond their years, and we can't forget everybody in between! It's cliché, sentimental, and 100% true: Pagoda's members are what keep us going, what brings a smile to our faces after a particularly arduous day, and what makes Pagoda the most warm, caring, funny, and accepting community any guild could ever be. Guild hoppers tend to find their homes here, people who are normally ignored in big guilds get no such treatment in Pagoda, and our members love to chat into the wee hours of the night. Pagoda has provided us with a community that not only helps us achieve our neopets goals, but also, incredibly, our real life goals. And though we are closer than peanut butter and gooseberry jam, we will eagerly accept any new member with open arms. Love, The Owners. 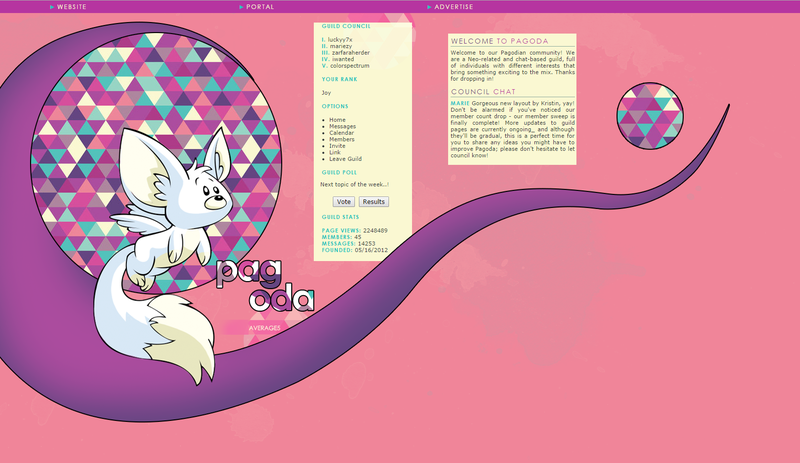 Pagoda is currently led by Michelle, one of the original creators of Pagoda. We also have several dedicated owners who keep Pagoda running smoothly. Pagoda's established age ensures that our members are knowledgeable, helpful, and mature. Bon voyage, my friends and welcome to Pagoda - the only place you can be a Pagodian. make pagoda your new family! Because Pagoda is a private guild, there is an application that you must fill out. Before that, however, you must meet our requirements. Please message an owner if you have any concerns or questions about the requirements. The use of correct spelling, grammar and punctuation is required while chatting on the guild boards. We do encourage the use of smilies, though! Guild mailings will allow you to receive important updates from the guild. Click here to enable them. Please post on the guild board when you first join the guild. We want to know who you are! We require all members to have a decent, legible font. Having your name in your font will help members get to know you. It is important that you remain active and post on the guild board at least five posts per week. If not, you risk being deleted. Contact Michelle to make other arrangements if needed. You may also post the app on the board if it is more convenient. Likewise, if someone has recruited you to Pagoda, your app may be sent to them to receive an invite. However, remember that not all guild members have invite privileges. Please fill out the following form thoroughly and completely; remember, we are a literate guild and expect well-written, if concise, responses. learn all the basic information! As of September 9, 7:20 P.M. Note: Pagoda was deleted on May 16, 2012, due to a misunderstanding on TNT's part. Pagoda was originally created on 11/25/2011, and accumulated 715k page views and 95k posts in the old guild. On 4/3/13 and 12/12/13, our post count was reset by TNT. We had accumulated 256k posts before they were deleted. The stats above reflect the guild's current stats. In total, Pagoda has accumulated ~354k posts thus far. Here is a snapshot of our current guild layout. Drag into the task bar above in order to see the image in full size. Being active in a guild is important, and we ask that you post at least five posts per week. If you are unable to uphold this for whatever reason, please contact one of the council members in advance. After a total of two or three weeks of inactivity, you will be deleted from the guild. You are more than welcome to reapply to Pagoda, though! Leave the spam in the can! Please do not post more than three messages in a row. Save that drama llama for your mama! Be respective of others and Pagoda. If you have an issue with a member, take it to neomails. If you feel as if someone is harassing or bullying you, contact a council member immediately. They will fix the issue for you. Uphold Neo's rules and regulations. No spam, bullying, begging, swearing or vulgarity. Any of these will result in immediate deletion. Please contact the Pagoda Team with any problems. We are here to help you! let's get to the very top! This is the immediate rank you receive when you first join Pagoda. You have become comfortable with your surroundings and with other members, and also have a post count between 300-649. You now know your way around Pagoda in your sleep, you help new members get settled, and have a post count between 650-999. You are an amazing member of Pagoda! You have been loyal, honest, helpful and have a post count above 1000. Certain members may be awarded admin at this rank. This rank is dedicated for sub-council, and is capped at five members at any given time. Sub-council is picked based off of post count, dedication, helpfulness, literacy and additional positive qualities. At any point you may be bumped back to the Ecstasy rank based on change of behavior or activity. With our wide variety of Pagodians, we have a large array of things to get involved in around Pagoda. For our chatty members, interaction with each other on our active message boards is an exhilarating past time. These boards are unlike any other guild boards. Pagoda's board topics range from Forth of July in December, to Chunka Hunka monkey love, while other life topics like school papers, sports and baby nurseries are often brought up. Habitarium, Key Quest, Restocking and avatar tips are commonly exchanged, and the next moment a food fight has started. Speaking of food, we can't forget our daily Subject changes based on the day of the week. Pagoda is full of inside jokes that only our members would be capable of coming up with. Dungeons guarded by rainbow unicorns? Body guards? Monkey soap opera? Female beetle secretions? At Pagoda, you never know what you will come across. For the child inside all of us, Pagoda has many activities for its members to take part in. Board games, theme days and Keyquest tournaments are just a few examples. Members who are interested in reading and writing enjoy looking through our newspaper, guides, yearbook, and may even consider writing their own guide to enlighten fellow members. For the artistically inclined, the boards offer a useful way to receive constructive criticism from many different views. Our graphics page and fonts page group all Pagoda-related graphics onto their respective pages and is always looking for new additions! In the hopes of helping fellow Pagodians, our members have created their own guides to share their knowledge of various subjects. These topics vary from being lent on the Avatar Chat NeoBoards to Habitarium. Our optional account improvement feature encourages members to work on their own accounts and help out other Pagodians in reaching their goals. Avatar collecting is a popular pastime of Pagodians. Our avatar lending includes many items, pets, and petpets such as ZDAP, draik, and a mootix/snowbunny bundle! On top of everything mentioned above, we additionally have an adoption agency, wishing star, seasonal events, and more! For links to all of our guild pages, check out our Portal. The following are quotes that have been snagged from our message boards. Pagoda has been my home for quite some time and I've honestly never met a better group of people. They're kind and friendly and always want to help each other out. We talk about every subject under the sun that TNT will allow, it's not just a bunch of fake "how's your day" conversations, it's real topics with people who are really interested in how you're doing. If you're feeling lonely on Neopets.com and you want to feel like you're apart of something bigger and to be accepted then Pagoda it is. I've spent the most of my Neo-life in one guild (for five years!) and just recently left after all the other members eventually moved on from the site. After a bit of searching for another guild, I've found Pagoda! It's only been about two weeks but I'm surprised at how much I could love another guild. There is always someone around to chat with, everyone is so nice and hilarious, and these people share my interests! What more could I have asked for? Thanks for showing interest in us! Due to Pagoda being a private guild, there is an application that you must fill out. Before that however, you must meet our requirements. As of Nov. 24, 2011 there are over ninety-five clickable avatars. Go here to collect more. Your guild mailings must be enabled in order to receive important guild notices and updates. Please post on the guild board when you first join the guild. We want to know who you are. Furthermore, you must have a decent, legible font. have a question or comment for an owner? Michelle is one of the owners of Pagoda. She will be a freshman in college and hopes to pursue a career in health or business. You can usually find her popping in and out of conversations on the boards, lurking like a wild pokemon, or working on getting those elusive avatars. Feel free to ask any questions about the guild you may have! Naomi, who also answers to Gnomey, Nay Nay, and Naomikins, is currently pursuing an English major at the University of Pennsylvania. One day she hopes to teach creative writing at a university, but for now, she's more than content living college life to the fullest, drinking too much coffee, and sleeping too little. On neopets, she collects gnomes and cybunnies, codes for Pagoda, and spends most of her free time chatting it up on Pagoda's message boards. Sammi, an owner of Pagoda, has just graduated with her degree in marketing and has no clue what's going to happen next. She helps make graphics and layouts for Pagoda and can be found chatting on the boards, betting in food club, changing the fonts on her 3 NB pens, or protecting her Habitarium from Anna. Although her unrealized goal of becoming an Olympic gymnast is out of her reach, she did win the hilarity star chart competition once which is just as good. Oh, and cats. Pagoda is a neo-related, literate, chat-based guild that aims to bring together individuals with all different interests and backgrounds. Pagoda strives to not only offer exciting and unique activities and events, but also to offer members with resources that will allow them to achieve their goals.